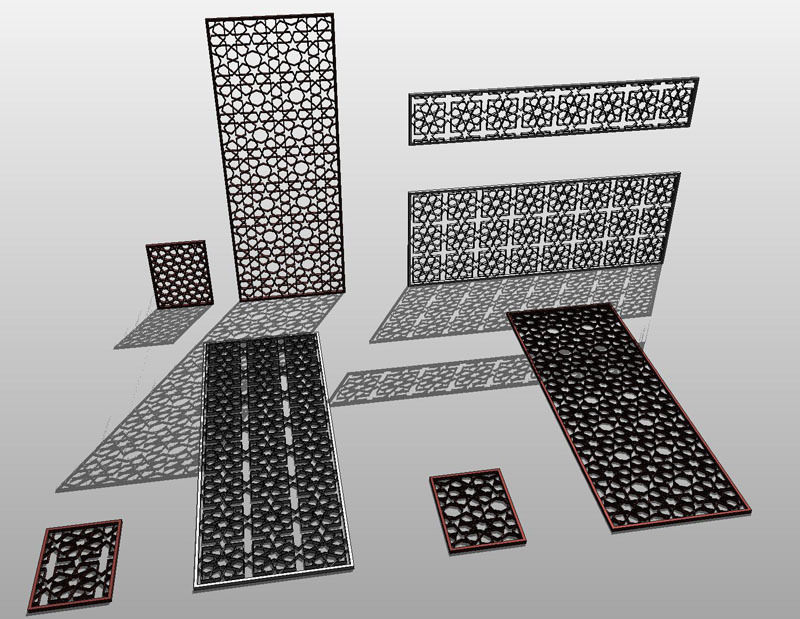 Musharabiya screens are popular design elements in the Gulf Region. Everyone loves them. They look good, they come in all shapes & sizes, they are functionally justified and environmentally friendly. 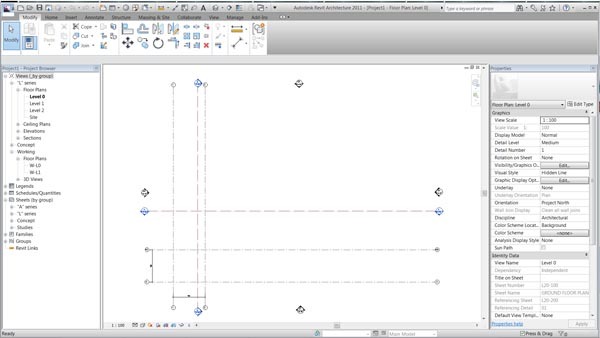 But how best to make them in Revit ? Its easy enough to make a fixed size screen or to take a fixed module and use it in a parametric array. But in practice the sizes you need are probably not so well behaved. Currently we have a project in Oman that uses screens with sizes like 2930x1150 and 3120x1230. 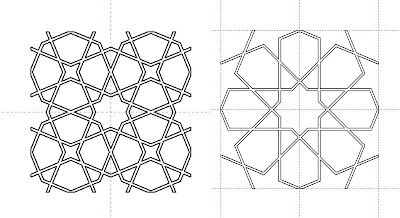 I need to make these using a regular pattern module of say 600x600. Early attempts used extrusions for the panels and voids to trim the edges down to size, but they were never flexible enough to cover all sizes & the panels tended to distort at the edges. So last weekend I tried again with much better results. reference planes tend to push the panels around when flexed, reference lines don't. 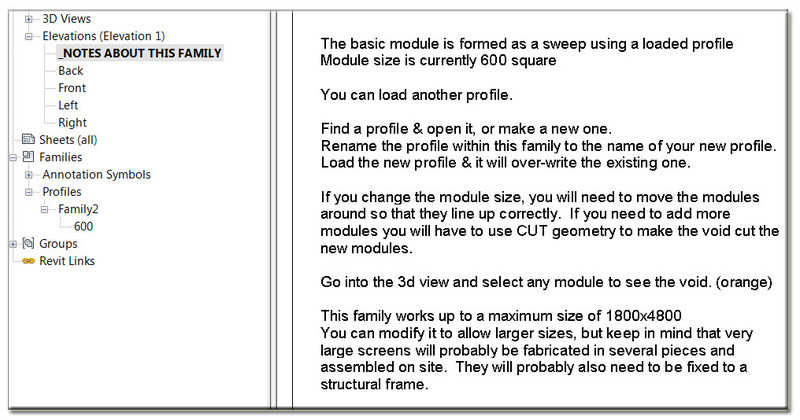 Screenshots & notes below describe how the family works. 3 versions of the family using different profiles (patterns) Workplane based can be horizontal or vertical. Size variable up to 1800x4800. Material by subcategory and/or parameter. Rectangular frame with width & depth parameters. 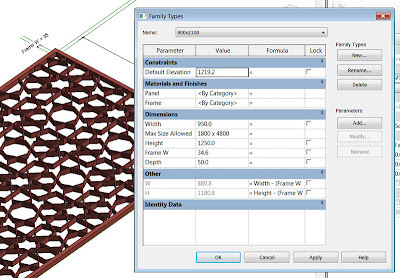 24 panels controled by the same profile family in 8 rows of 3 define the maximum size. Smaller sizes are created by a void extrusion. Reference lines control the void cut and host the path for the sweep that forms the frame. One final trick. 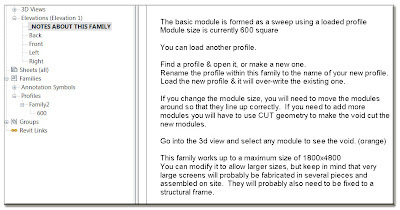 By duplicating one of the elevation views I create a place to display text notes to guide future users of the family. For those at GAJ, I will put the family on the server.